esus says in John’s Gospel, “This is my commandment, that you love one another as I have loved you.” Sheridan is a community that encourages reaching out beyond ourselves to love our neighbor – in every corner of the world. If you’ve ever wondered how you can make a difference as a Christian in the world, you are in the right place. Sheridan offers mission trips abroad and special events here at home that foster the love that Jesus commands. Be encouraged to reach out and share the love of Jesus that crosses language, race and national boundaries. Be a part of our global missions. There has been a shift in how churches reach out to those who are suffering. As Jesus says in Matthew 25, we will see his face in the poor, the hungry, the thirsty, those imprisoned and those in need. As missionary societies developed in churches in the late 1800s from Europe and North America, the standard practice was to anoint a few missionaries to go to foreign lands to proclaim the Gospel. Everyone else would stay home, pray and share offerings to support the work of the missions. As our society and communities have become more global, the opportunity to share the Gospel through short term mission trips and long-term indigenous partnerships has grown exponentially. Not only do churches reach out to those in need, but government and non proﬁt organizations reach out as well. At best, resources are organized and distributed and communities are given the ability to leave poverty in the rear view mirror with each generation. At its worst, charitable work creates a system of dependency and confused mess. It often leaves questions of who’s in charge for the long haul, and who continues to keep those most vulnerable at the helm of developmental work. In the last decade, Sheridan has been a ﬂagship congregation of mission development for the long haul. We are charitable in times of crisis, but also extremely generous in our long-term development. We should be proud of how we manage the resources God has given to us. For more information about becoming involved with any of these ministries, contact Pastor Rhonda Bostrom r.bostrom@sheridanlutheran.org. To stay up to date with missions and outreach, subscribe to our Mission Moments Newsletter. 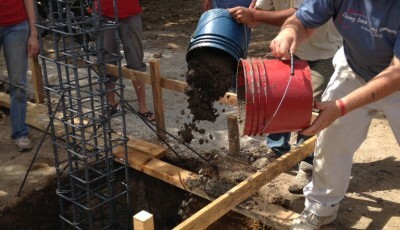 Each summer, a Sheridan team and other ELCA congregations provide a summer camp in southern Haiti. More than 300 children in the town of Jacmel, Haiti, will gather to hear of God’s love for them. The camp provides two meals a day, VBS curriculum, singing, dancing and fun! 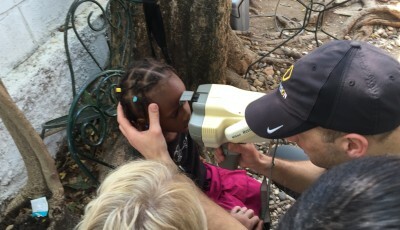 Also, once a year Sheridan members and friends work to help provide an optometry clinic for HTF partners. Optometrists needed as well as non-medical personnel. Make a big difference in the life of a family as you help build a house with others from Sheridan, working in concert with Habitat for Humanity. For several years Sheridan has sent teams to this region of El Salvador and recently expanded its partnership to other countries. Our partnership is strong and this opportunity for service not only builds houses, but builds people for the kingdom of God! Sheridan Lutheran Church began a companion relationship with the Mudio Lutheran Parish in 2005. Each year, groups from Sheridan go to visit our brothers and sisters in Christ in Tanzania. 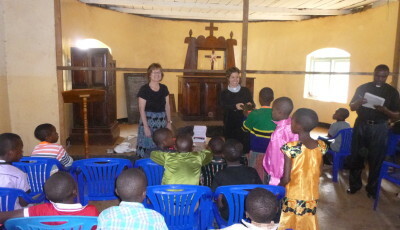 Sheridan continually supports the mission and ministries in Tanzania. Whenever we visit our international ministry partners, it means so much when we tell them that we remember them in our thoughts and prayers. When life is a daily struggle, even the smallest tasks seem burdensome. For so many of our global partnerships, having access to clean water, a steady food supply, safe shelter, education and job opportunities is not possible. The absence of these basic resources make life very difficult. Through our ministry partnerships, we work together, as brothers and sisters in Christ, to end these obstacles that make life so difficult. We are able to do this work through the support and encouragement of many. And being remembered in prayer not only encourages our ministry, but it makes us all stronger! Search Google and find the country where our international ministries exist. What is the poverty rate, life expectancy, literacy rate? Pray for our ministry partnerships to remain strong in these countries. Speak with someone from Sheridan who has visited one of our ministry partners. Listen to their story, invite them to speak to your family, or an organization of which you are a part. For more information on who to contact, speak with Pastor Rhonda Bostrom.